LuckyMe - Sticker Pack. LuckyMe. A set of four vinyl stickers. Our 'All Seeing Aye' logo in Black & White, and Silver with Pink, Green & Yellow. Durable vinyl stickers at 11cm diameter. 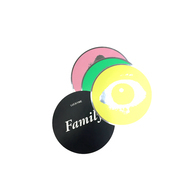 Each purchase receives four colours of sticker: x1 black n white, x1 green on chrome, x1 pink on chrome, x1 lemon on chrome. Our logo is the 'all seeing aye' - the inscription in the run-out groove of our first release.